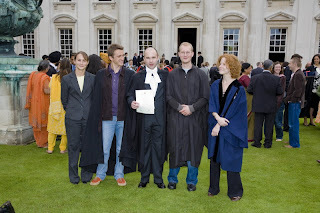 In front of the Senate House (where the degree was conferred), right after the ceremony - with my sister, Florian, myself in the middle, and Alex and Sania to the right. 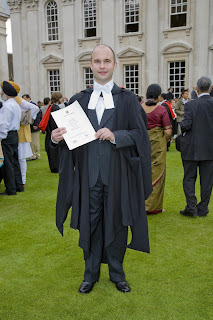 Glad they were allowed to get into the ceremony without a ticket, but the insider knows: Sania is wearing a gown from Trinity College (i.e., the richest, most famous, and the best college anyway) which gets you anywhere in Cambridge (might also have been her hair which bedazzeled the guy checking the tickets, but we will never find out). 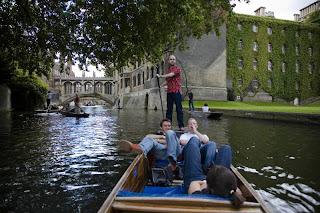 And punting the next day up and down the Cam. 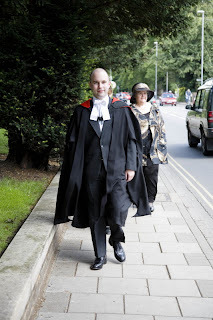 This was a really, really nice weekend back in Cambridge and I was glad I went there for the graduation. Thank you to everyone visiting me and spending time with me there, you made it a really good time for me!